Christina Robbins from Digitech Systems wrote an amazing article on different personalities and how to handle them while implementing a new Document Management System. How do you help your customers manage the conversion from paper to digital? For many technology gurus, our thoughts immediately jump to hardware and software, but leadership research shows that people are the most common reason that IT projects fail. In a list of the 101 most common reasons projects fail, more than 60 percent of the items were related to people and change management. So, improving your ability to guide your customers through a change process will result in better overall project success rates and higher customer satisfaction. Though it may seem commonplace to those of us in the document management industry, the conversion from paper-based information to digital can be intimidating for some individuals and teams triggering the resistance behaviors that lead to project failure. Understanding predictable, emotional responses to change can help you guide your project champion through managing individuals during a change process. 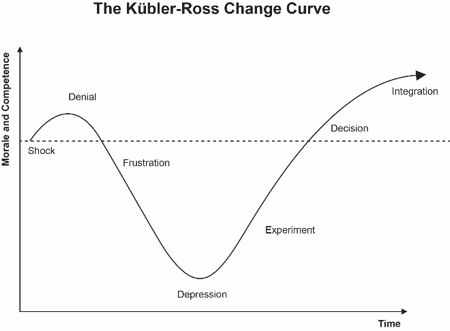 Though usually applied to grief, the Kübler-Ross Change Curve offers a useful model for managers struggling to understand why employees resist change. Why grief? From an emotional perspective change, especially significant change to entrenched work behaviors, feels like a loss of something important. All employees pass through all stages, but individual resilience and personality may influence how long they spend above the dotted line in positive emotions versus below the line in negative emotions. As you consider change from this perspective, stereotypical emotional responses begin to emerge. For simplicity, I’ve identified them as the following fictitious members of most change teams. These typical resistance profiles may emerge in any combination on any specific project team, so leaders should carefully consider the responses of individual team members as the project unfolds. As you review these profiles, what do you notice? If left unmanaged, only one of these people will actively help the leader to promote the change and do what is necessary to ensure its success! So, it is the responsibility of the leader to help employees move through the stages of the change cycle to ensure they reach positive and productive outcomes for the organization. In a recent TED address, Jim Hemerling explained, “Let’s acknowledge that change is hard. People naturally resist change—especially when it’s imposed on them.” Helping employees embrace change requires a more nuanced approach than simply getting them involved early or tossing out incentives for top performers. Start by managing people individually in ways tailored to their stage in the change cycle, and recognize victories along the way. Understanding the emotional response of each team member guides the change leader in formulating an individual plan for each. Consider the following strategies for the Patricks, Ursulas, Normans, Ricks, and Angelas on your team. Positive Patrick– Put Patrick’s positive, change-friendly personality to work for you. Here is your system super user and team champion. Patrick should be part of helping to decide what document management system to use and how its features can be applied to your specific situation. He can also provide the leader with insight about other’s true attitudes and performance (which are often intentionally camouflaged by less change-friendly personalities). Uncertain Ursula — Spend one-on-one time with Ursula. She needs a personal reason to embrace the digital universe. Once she’s convinced, she’ll often become a powerful and persuasive advocate who helps the rest of the team figure out how to move from the negative frustration/depression part of the change curve into experimentation and a decision to support the change. Neutral Norman – Leaders often ignore Norman, assuming he’ll get it in time. This is dangerous! When other, more negative teammates, see Norman choosing not to participate they believe it is ok for them to fail to participate as well, and they will aggressively recruit more rebels. Before you know it, you’ve got mutiny on your hands and an office still crowded with paper documents! Make sure Norman is engaged. It may be helpful to give him a role that involves training other teammates, so he is forced to learn and understand the digital process. Usually, once he understands the change, he’ll go along and help others as well. Resistant Rick – Here again is a change profile that leaders are tempted to ignore, and again that choice is dangerous! Each time Rick justifies his resistance—whether to himself or others—he reinforces why he must resist (his moral high ground). If left too long, Rick will convince himself that if the change goes forward, the only answer for him is to quit in protest. Conflict-resistant leaders will cringe, but you must confront Rick one-on-one. Let him talk himself out in explaining his reasons for resisting, and then walk him calmly through the reasons why the organization is moving forward with the conversion to digital documents and electronic workflow. Identify personal, positive outcomes that will be of benefit to Rick once the change is fully in place. Invite him to participate by experimenting with the technology, and help him to understand that continuing to resist will be a career-limiting decision. Angry Angela – If you can identify your Angelas at the onset of the change initiative, the best strategy is to get them engaged early and have them participate in defining what document management technologies are chosen and how they get implemented. If caught early, sometimes Angelas become strong supporters of changes they help to initiate. If your Angela emerges as the project unfolds, you may be dealing with someone who has become stuck in the depression/frustration phases of the change cycle. Personal coaching from peers and the change leader are necessary to see if Angela can move forward to experimenting with the application and if she can decide to embrace digital processes. If you can continue to help Angela progress back to the positive side of the cycle, you’ll have another supporter. If you’re unable to convince Angela to try, after repeated attempts it may be time to move forward without her as part of the team. All of your team members need to be aware of successes as they happen. At the project’s outset, identify key indicators that will demonstrate that the project is moving forward and making a difference as well as the success milestones, or big picture measurable results, that you’re hoping to attain from the project overall. As each success is realized, make a big deal of it. Call out individuals who are making progress and be careful to identify personal milestones and successes without comparing overall progress between employees. If you’ve identified personally important results for any of those Ursulas and Ricks on your team, be sure to chat with them individually to make sure they see that those benefits have happened and are working in their favor. Armed with this simple model for explaining common emotional reactions to changes in the workplace and how to address the behaviors in a one-on-one fashion, you can now more effectively guide your customers in successfully managing change at the human level. This is the first in a multi-part series on leading change. Look for additional articles on simple processes that increase the likelihood of successful projects and tips for leaders tasked with managing change initiatives.